on their farm in Goose Creek, Union Co., NC.click on photo for larger view. .
From left to right on the top row are: James Vann Griffin, Jennie Elizabeth Griffin, Mark Alexander Griffin (my grandfather), Lola Martha Griffin, William Ray Griffin. 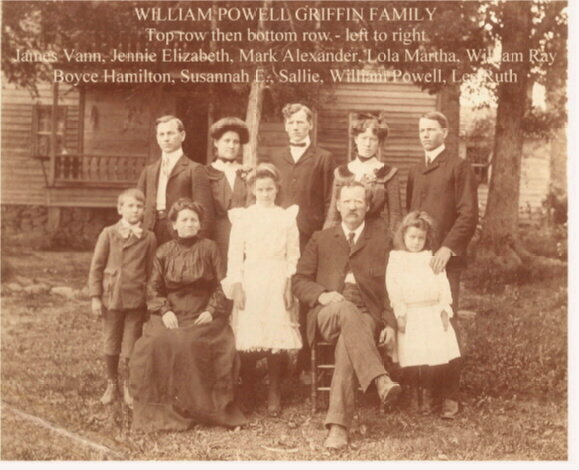 On the bottom row from left to right are: Boyce Hamilton Griffin, Susannah Ellen Hamilton, Sallie Griffin, William Powell Griffin, and Lee Ruth Griffin.